IN FACT, WE JUST CALL THEM FRIENDS. YOU'RE ONE STEP AWAY FROM BECOMING OUR NEWEST FRIEND. LET US SHOW YOU HOW BAREFIT CAN GET YOU IN THE BEST SHAPE OF YOUR LIFE! What Is Your #1 Fitness Goal Right Now? 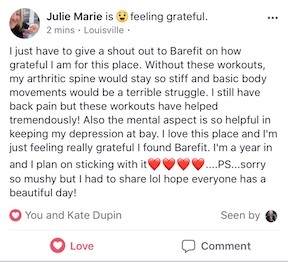 THANK YOU FOR YOUR INTEREST IN BAREFIT! WE ARE EXCITED TO LEARN MORE ABOUT YOU AND HOW WE CAN BEST SERVE YOU IN REACHING YOUR FITNESS GOALS. CLICK HERE & FOLLOW INSTRUCTIONS TO RESERVE YOUR PASS TODAY! Q: Who Should Be A Part Of The BAREfit Training Community? A: Hikers, Runners, Cyclists, Climbers, Paddlers, Yogis, OCR Competitors, & Everyone Else Who Wants To Optimize Their Mind & Body For A Life That's Full Of Adventure. Q: What Are The Main Benefits Of Being A Member @ BAREfit? Q: Do I Have To Be In Great Shape? A: No. In Fact Most Of Our Newer Members Aren't. We Are Here To Get You In Shape! Otherwise, If You're Ready To Get Rollin, CLICK HERE To Return To The Top Of This Page!